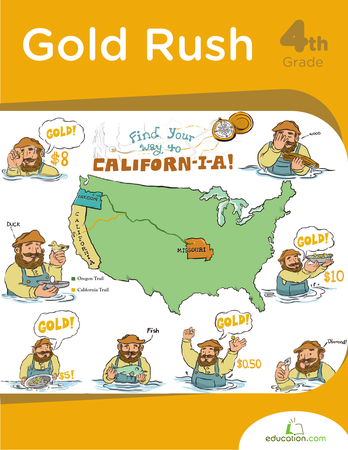 Gold rush worksheets make learning history fun! This board game is a thrilling race across the Wild West, and teachers players that claiming their fortune in the California Gold Rush wasn't as easy as it sounded. Of all the gold rush printables on the site, this is one you'll want to laminate and play again! The California Gold Rush sets the stage to practise reading and social studies skills. Convert prices of supplies from the California Gold Rush to today's monetary values. What you find in this fun history and maths exercise may shock you! All businesses, even ones made of gold, need a plan. Try making your own business plan during Gold Rush times and draw an advertisement for it.